In addition to thoroughly cleaning the hair, a good shampoo should also be gentle enough to keep the hair well moisturized and soft; this can be accomplished by combining just the right balance of ingredients in just the right amounts. A thinning hair shampoo should be enriched with Jojoba Oil and Polysorbate 80 to remove oils and waxy buildup. Also, Panthenol (Provitamin B5) and Biotin help increase the thickness, body and texture of each strand. Leading authorities on hair recommend shampooing every day. This washes away scalp oils containing the hormone DHT (dihydrotestosterone) which contributes to hair loss. Like shampoos, conditioners must leave behind enough ingredients so that the hair combs easily and feels soft, but not so that the hair looks weighted down or greasy. The best ingredients to look for in a hair conditioner are Liposomes, Wheat Protein, and plant extracts such as Horsetail Extract and Stinging Nettle. Conditioners should strengthen your hair, adding volume and shine. Always brush hair to loosen dirt and scalp flakes, while activating oil glands. Massage scalp gently to relieve tension and aid blood circulation in the scalp. Wet hair thoroughly with warm or lukewarm water. Pour a small amount of shampoo onto the palm of your hand, rub both hands together and smooth shampoo on evenly. (Pouring shampoo directly onto the hair makes even distribution impossible). Massage shampoo into scalp with fingertips, adding more water for suds. Spread the lather quickly throughout your hair, leave on for several seconds, comb through, then rinse with warm water. After the first thorough rinsing, the second rinse should be with water which is progressively colder. This reduces “swelling” of the hair tube and stimulates circulation. Cold water also makes the hairs stiffer and stronger, while locking them more firmly into their root. The final step is to gently comb the hair with a wide-tooth comb rather than a brush which can stretch and break your hair. pH is a scale chemists use to measure acidity and alkalinity. The scale ranges from 0 (very acidic) to 14 (very alkaline). The mid-point 7 on the scale is equal to the pH of distilled water. The “natural” pH of hair and skin is between 5 & 6: in other words, slightly acidic. Both a highly alkaline or extremely acidic substance will damage your hair and skin. A shampoo should have a pH of between 4 & 7, which is within the normal pH range of the scalp. Many people with serious dandruff problems maintain healthy hair thoughout their lives. For those with thinning hair, however, a dandruff problem may worsen the condition. Dandruff itself does not cause baldness. It is the result of increased skin cell production combined with excessive oil secretions. The two most basic steps in dealing with dandruff are massaging the scalp and frequent brushing. Blow-drying, if done properly and in moderation, can actually benefit the scalp and hair. Blow-drying can increase blood flow to the scalp and thus improve circulation of vital nutrients to that area. When you finish shampooing and conditioning with that last cold rinse, you have also restricted blood flow to the scalp. Using a warm blow-dryer can help raise the temperature of the scalp and restore circulation. To get the full benefits from your blow-dryer, remember to keep the air moving over your head and not to leave it in one spot too long. Also, make sure the dryer stays at least 6 inches from your head. Avoid prolonged exposure to sunlight, water, sand and chlorine. Cover your head with a hat as much as possible. Aloe Vera to restore the precious moisture balance lost through blow-drying, tints and perms. 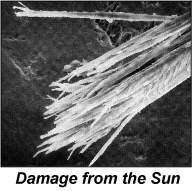 Panthenol (Provitamin B5) protects hair from the damaging effects of the sun and pollutants. Jojoba Oil dissolves salt build-up due to perspiration. 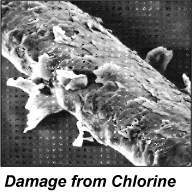 EDTA removes chlorine damage caused by swimming pools and hot tubs.